This is one of the most confusing, intriguing and debated Scriptures in the Bible. Much of the confusion comes from searching man's commentaries instead of “search the Scriptures” as Jesus told us in John 5:39. I have struggled much with the true meaning of this passage. In this article I want to present a humble and insightful commentary on this Scripture. I can begin by saying irrefutably that Acts 2:38 does not teach that water baptism is required for salvation. The Bible is very clear that we are saved by believing that Jesus died on the cross for our sins and rose. 1st Thessalonians 4:14, “For if we believe that Jesus died and rose again, even so them also which sleep in Jesus will God bring with him.” Whatever interpretation we may suggest, it MUST be in agreement with the rest of the Holy Bible to be accurate. John the Baptist plainly taught the people who came to him for baptism, that it was just water, but he said Jesus when He comes would baptize them with the Holy Spirit. John 1:26 and 33, John answered them, saying, I baptize with water: but there standeth one among you, whom ye know not ... And I knew him not: but he that sent me to baptize with water, the same said unto me, Upon whom thou shalt see the Spirit descending, and remaining on him, the same is he which baptizeth with the Holy Ghost.” This seems to explain Acts 2:38. Repent means “to think differently.” Baptize (transliterated from Baptizo) means “to make whelmed, that is, fully wet, immersed.” Baptizo may or may not refer to water baptism when used. There is no English word for baptize, so the word was directly carried over from Greek to English, which is called transliteration. So a literal interpretation of Acts 3:38 would be, “Think differently and be immersed with the Holy Spirit in the name of Jesus Christ to be pardoned of your sins.” This is what I think is the accurate interpretation here. In order to understand the Scriptural teaching regarding baptism, you must know what the word means. The Greek words translated "baptize" and "baptism" are "baptizo," "baptisma," and "baptismos." Even if you are not a linguist, you can see from the above that the word "baptize" is not really a TRANSLATION of "baptizo" at all. The translators simply replaced the "o" with an "e." This is called a TRANSLITERATION not a translation, because in true translation work the meaning of the word is carried over from one language into another. In the case of the word "baptize" or "baptism" this was not done. The result of this is that every time someone reads or hears about baptism, he automatically thinks it must mean WATER baptism. So, when such a person reads in Acts 2:38, for instance, "Repent and be baptized . . . for the remission of sins," he erroneously concludes that one must be dipped in water to be saved . . . because the verse does say you have to be baptized to receive God's forgiveness. Much harm and confusion has resulted from not understanding the real meaning of baptism. It means "to whelm (engulf or cover) and to cleanse." When Scripture refers to WATER baptism the context ALWAYS makes this clear. When water is not mentioned in connection with baptism, we need to use utmost care in our study of the passage so that we will recognize what kind of "baptism" (cleansing or whelming) is being spoken of. SOURCE: Dr. Ray Stanford, “Personal Handbook of Evangelism,” page 54. (1) To be "baptized" means to be "cleansed." (2) These unbelieving Jews were pricked in their hearts when Peter reminded them that they had a part in crucifying Jesus. And Peter tells them to be CLEANSED of this sin "IN the NAME of Jesus Christ"-the very One they helped crucify. 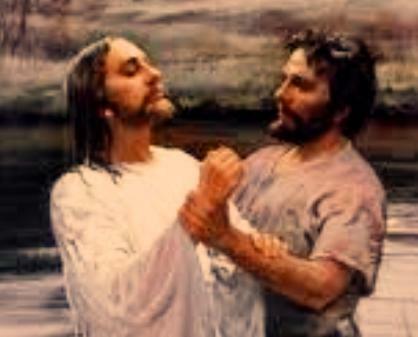 (3) Peter said to be "baptized in the Name of Jesus Christ." Some assume that Peter meant for these people to be baptized in water, and as they were being baptized, Peter would say over them, "I baptize you in the Name of Jesus Christ." However, this is not what God has recorded. It is what men have added. GOD says these people were cleansed in CHRIST'S NAME. Remember, His Name means "God who saves, keeps, satisfies," etc. There is cleansing power in His Name! (4) Notice, when these people were cleansed in Christ, they received the gift of the Holy Spirit. Therefore, this is another verse showing that the baptism or cleansing that accompanies salvation is of the Spirit -not of water. (5) Notice, it says the GIFT of the Holy Spirit. If you needed water baptism for salvation or to receive the Holy Spirit, neither salvation nor the Holy Spirit would be a GIFT of God, but of the works of man. ( 6 ) When "baptism" refers to water, it means to be made fully wet; when it refers to salvation, it means to be fully or completely cleansed by the Spirit. Acts 2:41 records that 3,000 trusted Christ as the result of Peter's message. If the baptism here were referring to WATER baptism, where could Peter baptize 3,000 people? He and all the people were in the Temple area, and there was NO WATER THERE except for a small laver in which the priests washed their hands and feet before entering into the Holy Place. But verse 41 says that these 3,000 souls were added to the disciples that "same day." In the entire passage water is not mentioned even once. (1) Only unbelief condemns. Being water baptized or not being water baptized has nothing to do with it. (2) The baptism here is Spirit baptism, not water baptism. SOURCE: Dr. Ray Stanford, “Personal Handbook of Evangelism,” pages 55-56. Yet, wait a minute, I've also heard Bible scholars like Dr. John R. Rice (1895-1980) teach that Acts 2:38 refers to water baptism. Brother Rice teaches that this verse says to repent and be water baptized in lieu of your sins being forgiven. Some people think that this passage contradicts the dozens of other plain statements in the Bible that a man is saved by faith and saved immediately when he believes. But when you use the word for in this passage just as it is used so many times in every-day conversation, you will see what Peter said. A man is arrested for stealing; one is grateful for a favor; one is blamed for carelessness; one is commended for bravery. The word for here does not mean in order to or to secure remission of sins, and it is not rendered that way in any translation of the Bible we know of anywhere. The Greek word eis here translated for is sometimes translated in the Bible against, among, at, unto, upon, etc. It might properly be translated here "baptized upon the remission of your sins" or "baptized referring to, or pointing toward the remission of your sins," or "baptized in the remission of your sins." When one repents, he receives the remission of his sins. Then the obedient heart, following Christ in baptism, is promised the gift of the Holy Ghost, an entirely separate mutter from salvation. What Peter said was that people ought to repent and then, after their sins are forgiven, they should be baptized as evidence of that. That is exactly what people ought to be baptized for, that is, to show the remission of their sins. That Scripture, then, does not mean that people ought to be baptized in order to be saved. Although there are many faithful preachers who believe both positions, I am firmly convinced that Ray Stanford has it correct. One thing that I have an issue with is Dr. Stanford's opinion that Acts 2:41 also refers to the baptism of the Holy Spirit. He contends that 3,000 people could not have been water baptized because of a lack of water; however, I researched this matter and learned that there is plenty of water in Jerusalem, at the Pool of Siloam. Strangely enough, I am convinced by the context that Acts 2:38 refers to the baptism of the Holy Spirit (being born again) and Acts 2:41 is referring to water baptism (the believer's public profession of faith). I believe baptism in Acts 2:38 is the new birth in Christ, born from above by the Holy Spirit of God. This is what Acts 2:38 means I am convinced, just as John the Baptist foretold. John foretold that Jesus would baptize with the Holy Spirit. It is the baptism of the Holy Spirit, not water. Everyone who believes the Gospel is baptized by the Holy Spirit (saved). The Spirit indwells each and every born-again believer (1st Corinthians 3:16-17; Romans 8:9; 1st John 3:24). When you change your mind (think differently) from your way of how to get to Heaven, to God's way, and you begin to trust Christ's sacrifice upon the cross as payment for your sins and His resurrection, then you are baptized (fully whelmed) with the Holy Spirit and saved. This is what Acts 2:38 is saying. Literally, it means to be born-again (by the Holy Spirit) in the name of Jesus Christ. This is what it means to be baptized with the Holy Ghost. NOTE ON THE FULNESS OF THE HOLY SPIRIT - Please don't confuse this with the believer's fulness of the Holy Spirit (printed sermon by Dr. Jack Hyles) that only comes by much prayer, obedient clean living and walking with God. This has nothing to do with salvation. Eternal life is a free gift. However, in order to have the power of God rest upon our life and ministry for Christ, we must empty our self of self so that God's power can work through us. Dr. John R. Rice preaches about, The Fulness Of The Spirit, teaching from the Bible that only through total obedience and much prayer can we have God's power to win souls and influence others for God. Oh, how we need the fulness of the Holy Spirit in our churches today. Most people make the error of assuming that “be baptized” in Acts 2:38 must means water baptism, because that is the modern popular understanding. My friend, your pastor can baptize you with water, but that won't save you. You must be baptized with the Holy Ghost, which only Jesus Christ can do when you believe on Him as your Savior. Adding water baptism to partial faith in Christ is religion, not the gift of God. We are saved by completely resting in Jesus Christ (Hebrews 4:10-11). Throughout the New Testament we read that we are saved by believing on Christ. John 6:28-29, “Then said they unto him, What shall we do, that we might work the works of God? Jesus answered and said unto them, This is the work of God, that ye believe on him whom he hath sent.” If water baptism were necessary for salvation, then it would have been mentioned, but it's not. It is ridiculous to entertain the notion that the Bible is requiring water baptism for salvation in Acts 2:38, when dozens of times we are told in the Bible that salvation is solely by faith (Ephesians 2:8-10; Genesis 15:6; Isaiah 45:22; Romans 4:5-6; Galatians 3:24-26; Titus 3:5; Romans 11:6). NEVER lift any particular text out of a passage without considering the surrounding context, and the entire Bible for that matter, or else you'll wrongly interpret the Bible. Acts 2:38 can be interpreted several different ways; however, if we cross-reference Scripture-with-Scripture and let the Bible explain itself, then we really can only conclude that this is the baptism of the Holy Spirit of which John the Baptist foretold. We know that Acts 2:38 cannot mean, “think differently and be immersed in water in the name of Jesus for the forgiveness of sins.” That would go against the Biblical teaching that salvation is without works. Water baptism is a work, just as circumcision is a work, for which the apostle Peter rebuked the false prophets in Acts 15:1 who were requiring it. Acts 15:1, “And certain men which came down from Judaea taught the brethren, and said, Except ye be circumcised after the manner of Moses, ye cannot be saved.” This heresy is in the same boat as water baptism, that is, it is human effort (works). Water Or Holy Spirit Baptism? The following article was taken from the Friday, March 21st, 2003 Chicago Sun-times newspaper. This is so sad. 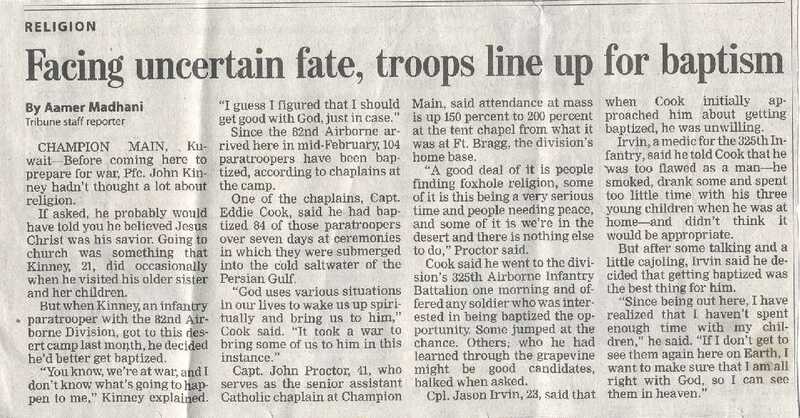 U.S. military troops were lining up over in Iraq to be water baptized, thinking that they'd be safe “JUST IN CASE” they are killed on the battlefield. The horrible truth is that baptism cannot make you safe. If you get baptized “JUST IN CASE,” then you are NOT saved because you are relying on something in ADDITION to Jesus Christ alone. If you ADD anything to simple childlike faith, you will go to Hell in your sins. DO NOT rely upon water baptism in the least as added insurance for Heaven. You trust Jesus, the Christ, and HIM ALONE!! !